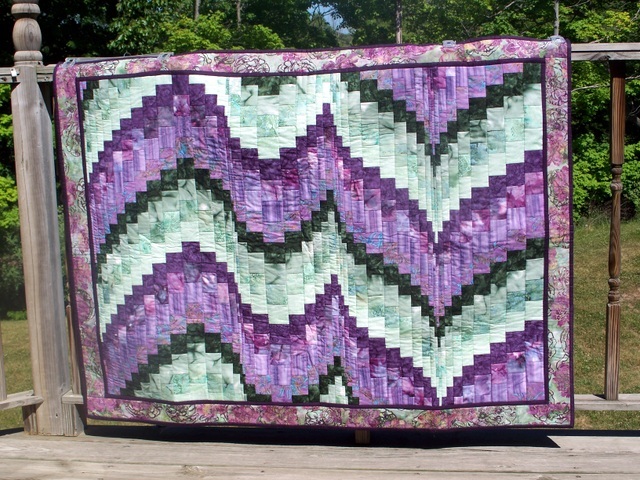 Has anyone made a bargello quilt using batiks? I have a bunch and thought it would look good. Any suggestions one advice? I want to make a kingsize bargello wave. Hope I'm not biting off too much. Shorten your stitch length a lot. Otherwise your strips fall apart. Make sure there is a high contrast between the lightest and the darkest so that the pattern is visible. A design wall is helpful to keep the strips in the right order or label the rows. It should be wonderful. Get going!!! Should be great. I did a rainbow quilt of hand-dyes. 24 colors, 4.5" cuts for 4" blocks. Just the right size for king size. For a true bargello, you'll want smaller blocks, probably 2" (cut 2.5"), or fewer different colors. I've made a couple of bargellos although mine have been large wall hangings -king size, WOW! One is my avatar. My best advice is Label, label, label your strip sets, rows, your pattern- anything that keeps you organized. As you attach your rows sew in opposite directions: if you attach row 1to row 2 by sewing from top to bottom, sew row 3 to row2 by sewing from bottom to top. Also do this as you sew your strip sets. Be careful not to stretch your strips and rows as you work with them. Whatever row you start with label it top left, right or center depending how your pattern is set up so you are always sure where you are in your construction. They are not hard, but you will enjoy the process more if you stay organized and work steady, but don't rush. Oh and don't work on it if your tired or distracted. That's how I came to redo rows 11-21 Enjoy we'll be looking for pictures! Have done a couple wall hangings and a tote bags with batik jelly roll strips in a Bargello type design. Main thing I was wanting was pleasing progression of colors and good contrast or shading as the design went together. Love working with batiks! I forgot to ask if y'all would post pictures too. I made a Twist-and-turn Bargello out of batiks. It was 60x60. If you go to QB gallery you can see some nice bargellos. My pictures were on my old phone and did not transfer when I got this one. I have made dozens of Bargello quilts and everything that Cybrarian has mentioned is absolute the best advice. I couldn't say it any better. Just be sure your needle is the correct size for sewing batiks. 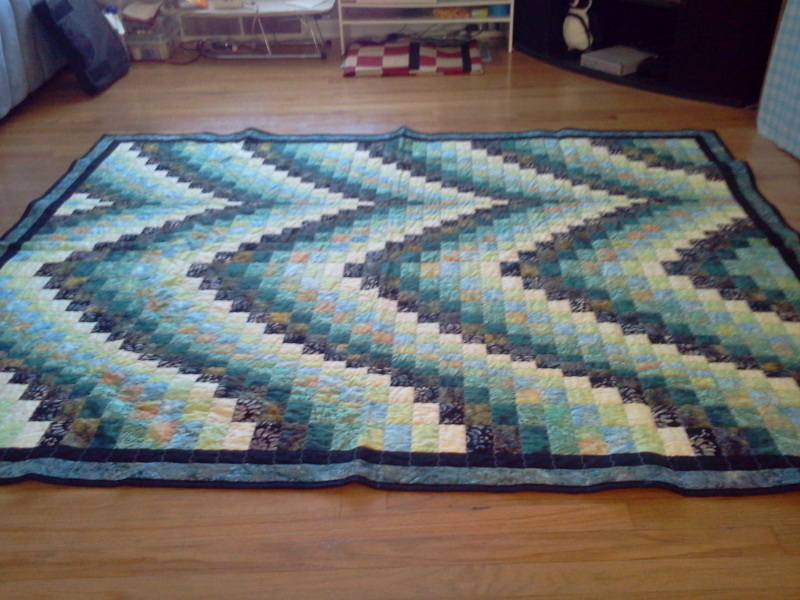 Here is my Bargello that I made for last yearr JAF contest but didn't even get into the first run off. Applique always seem to win over my Bargello quilts. I've made several bargellos, one w/batiks. Here is a pic of it. Both were QAYG. I lay the backing down, spray baste, then the batting, then I fuse gridded interfacing to the quilt sandwich. That enables me to keep my strips lined up correctly. Then start in the middle and work out in both directions. The next one I will piece, then quilt. Could you post a pic? yes i use #2 stitch length, keep in mind contrast of strip color, I use the whole 45" length strips. Yours will look wonderful!!!! Although I haven't made a Bargello quilt, I think batiks would be wonderful, especially if you get enough contrast in your fabrics. I truly love batiks, and maybe someday I'll make a batik Bargello. I've made 2 bargello quilts & a bargello jacket (I call 2012 my "year of the bargellos"). All as gifts, so no pictures available on this computer. 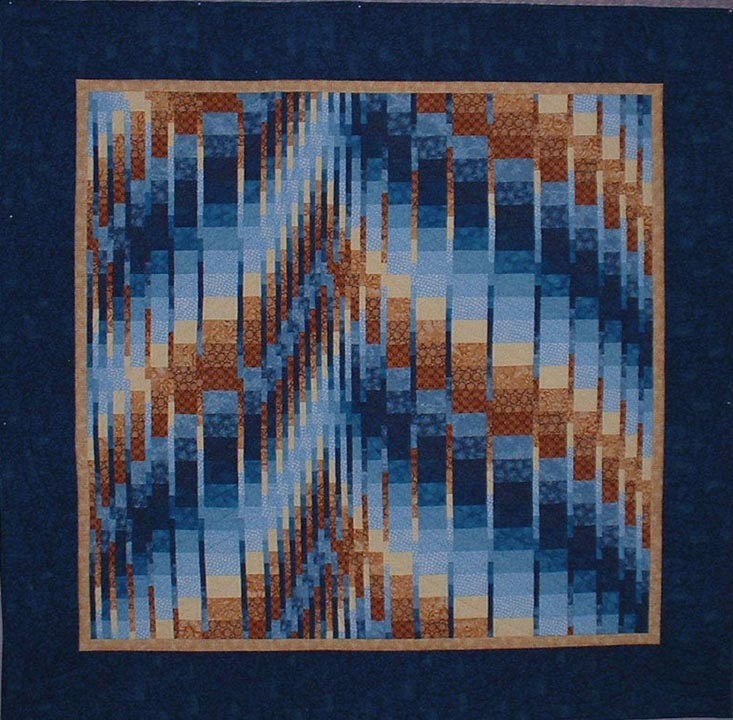 The one was queen size--actually was a class that the directions were for only lap size--so added a solid border and then modified a wave bargello on all 4 sides to create a queen. Then did a king size using a free Jinny Beyer pattern (Navaho star) for my son's wedding. The jacket used a narrow stip between the larger strips. In all 3 I used a combination of regular cotton and batiks and neither presented any problem. Bargellos just need to be done with a grid sheet and careful checking that you have the order of the fabrics right. I cut and then put my strips by size into marked bags. Also, use a post-it on the grid pattern to identify the row you are working on so that you don't "drift". good luck! I love both bargellos and batiks and tend to use batiks in most quilts. This is the first Bargello I completed with Batiks. Just completed a second one that was donated for a fundraiser. Both were a little wider, but shorter than twin size. Good luck with king size! Post your progress! Anything batik is beautiful! I would love to make a bargello with batiks!